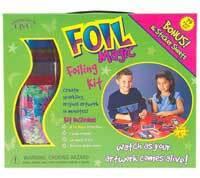 The Foil Magic Kit is an easy, no-mess way for kids to create dazzling designs. Simply write with the Foil Magic Foiling Pen, rub the colorful foil over the glue, and reveal incredible shiny pictures with multi-dimensional effects. They can also be used to decorate picture frames, greeting cards, scrapbooks and more. As a bonus, this kit also includes 16 sheets of stickers in various themes.